Reports of the health benefits of goat milk have been around for almost as long as people have kept goat herds! Many of these goat milk benefits have been widely accepted for hundreds of years in popular folk medicine lore. 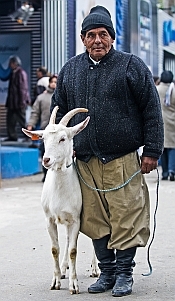 In fact, around the world, when it comes to health, GOATS are probably man's best friend! However, in this scientific era, proof is often requested to substantiate claims for improvement in medical conditions. Scientific studies are expensive, however, and you're not likely to find many that cover food substances like goat milk, simply because there's no company that has exclusive selling rights to goat milk to recover the cost! There are some studies. However, when it comes to testing the benefits of a natural substance like milk, the best scientist is YOU! It has been observed and recognized for many years in the medical world that a "cure" for an illness in one person doesn't always cure the same disease in another, even with no other obvious factors involved. And, a drug that is safe for the vast majority of people, may inexplicably cause a fatal reaction in some. Every person's body and environment is unique, and what works for one person may or may not work for another. So, unless you know that you have a milk allergy (read more about this in Protein in Milk and the Unique Properties of Goat Milk Protein) the only real way to know if goat milk may benefit one of your health issues is to try it for a length of time, and note whether your symptoms improve or not. And, the article, Goats' Milk Is More Beneficial To Health Than Cows' Milk, Study Suggests, shows that goat milk helps with the digestion and utilization of minerals that can help prevent iron deficiency and softening of the bones. For more information on the details that may explain why goat milk has been credited with helping such an array of health issues, read the articles at Goat Milk Nutrition Facts. From those articles, you'll see that the chemical composition of goat milk is uniquely situated to promote good health in a variety of ways. Of course, goat milk also provides all of the well-known health benefits of milk in general, as a good source of calcium, protein and minerals. The elderly have unique challenges to digestion and nutrition due to natural changes that occur in our bodies through the aging process. This article shows how goat milk and goat milk products are well-suited to overcoming the obstacles to proper nutrition in aging adults. Does being lactose intolerant mean that you can't enjoy ANY dairy products? Goat milk has often been touted as being a dairy-friendly alternative for lactose intolerant individuals, but is it really better than cow's milk for this condition? This article will give you the background and information you need to make an informed decision. Articles are updated frequently, so check back here for any new information on the benefits of goat milk!